#Antisemitism can be eradicated only by the Jews, when they unite among them “into one heart.” As a result, all the nations will operate for the sake of unity, and the whole world will reach oneness. Hence today everyone in the world must obligate all the #Jews to build systems of unification. Book of Zohar: In our time, Europe will de facto be overtaken by Islamic rule. All of this will degenerate into a huge Antisemitic and Anti-Israel wave. #Antisemitism is always a mandatory part of society’s development. Just as anti-Semitism surged with the backdrop of defeat in WWI, so it is now surging in native Europeans against the backdrop of failures in economy, politics, and social life. When I see anti-Semitic caricatures and slogans, I see the desperate demands to free themselves from internal dependence on Jews. We all need to understand that liberation from hatred and dependence lies in raising all humanity above egoism to the Creator, by the method of Kabbalah. It is said by the prophet (Isaiah) that the nations of the world should lead (compel, push) the people of Israel to the mountain of the Creator (revelation of the Creator). Their mission is to demand that the people of Israel show the way to the nations of the world how to reveal the Creator, to lead the peoples of the world toward unity with Him. This is the source of anti-Semitism. Anti-Semitism grows. History doesn’t teach anyone. It informs us and will repeat itself until we learn! Let’s accept hatred for us as a law of nature. We must study its cause, goal and proper use. #Antisemitism is demanding for us to change rather than to demand change from others. The goal is, in our #consciousness, to enter the upper world’s existence, a shared, balanced eternal state. Kabbalah reveals the method of entering it. Our time is the time of the method’s revelation. We can aspire to it in a good way or be nudged by evil—the choice is ours! Throughout 3,500 years, the Jews have forgotten about their mission to unite and unify all humanity. But the obligation hasn’t been lifted from them, and the nations of the world also subconsciously feel this and periodically demand it, without knowing what exactly to demand. To the extent both (Jews and the nations) become aware of the goal, they will resolve it together. Hatred for Jews comes from their origin and mission. They gathered from the nations of Babylon, following Abraham’s call to unite and in the unity, to reveal nature’s Upper Force, and then to reveal it to all the nations. They are hated because this hasn’t happened yet. The media is definitely not naive or uninformed. But their articles on #Antisemitism are merely informative. They lack analytics. No one understands the nature of this phenomenon, although it’s very well-known. It’s time to admit that this is a natural phenomenon and look for its solution in nature as well! #Antisemitism can be eradicated only by the #Jews, when they unite among them, as in one heart. Then all the nations will also proceed to unite, and the whole world will reach unity. Hence today everyone in the world must obligate all the Jews to build systems of unity. I share your concern over the decades-old Palestinian-Israeli conflict. Needless to say, people around the globe feel that finding a solution to this conflict is long overdue. If there is world consensus about the urgent need to put an end to this struggle, one must ask why, generation after generation, the state of affairs in this region only seems to worsen. So many countries throughout history, and particularly so many US administrations, have invested futile efforts in trying to mediate what is considered the most complex and controversial conflict in the world. Former US proposals were based on the core idea of “land for peace” as a kind of trade deal, but no such scheme will work, because territorial border issues are not at the root of the problem. Splitting the land will not help, as it has failed in the past with the Israeli disengagement from Gaza and in multiple offers from Israel to withdraw from the territories conquered in the Six Day War in exchange for peace. All such offers have been consistently rejected. The stark reality is the impossibility of negotiating a viable peace agreement with a regime controlled by those who refuse to recognize Israel’s right to exist. The truth of the matter is that the lasting solution to this conflict cannot be predicated upon acceptance from any parties outside the people of Israel. Peace among Jews must come first, and peace with our neighbors will follow naturally and smoothly afterward. This is because the fundamental cause of the conflict is our division, our lack of unity as one Jewish people. No state, religious, economic, or social plan will help until we connect into one diverse, yet amalgamated body. Lasting peace is possible and achievable, but its realization is conditional upon the connection of all Jews in Israel and around the world into one people, unified above our differences. The most fertile area for the application of US and world pressure is on the Israeli government, to demand that they enact an aggressive program to repair the breakage in Israel’s social fabric. It has become crucial for us, the Jews, to recognize our hatred and alienation from each other as preventing any positive future. As it is written, “we are commanded in each generation to strengthen the unity among us so our enemies do not rule over us” (Rabbi Eliyahu Ki Tov, The Book of Consciousness). When the correction of Israel radiates outwardly to the rest of the world, the second phase of the plan will be able to be effortlessly realized: the correction of humanity. Thus, “when the Children of Israel are complemented with the complete reason, the fountains of intelligence and knowledge shall flow beyond the borders of Israel. They will water all the nations of the world, as it is written” (Isaiah 11). 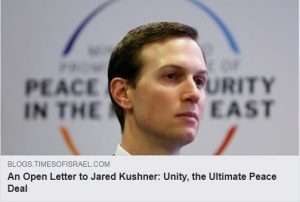 Therefore, I urge you to base the US plan for resolving final status issues for the Palestinian-Israeli conflict in applying pressure on the State of Israel to actualize the originally-intended purpose of the people of Israel, and to heal the fractures first and foremost within Israel itself. The ultimate plan for a lasting peace in the Middle East and beyond must require Jews to acknowledge their underpinnings, how we became the people of Israel, and to reenact the principles and purpose upon which the Jewish nation was founded. Only after we internalize the eternal spiritual ideals and foundations of Israel and unite among ourselves, will we be able to pave the way to peace with our neighbors and the world. This is the key to any viable plan for the Middle East, one capable of securing a bright future and a peaceful coexistence. Question: What should one do if the question about the meaning of life loses its sharpness after several years of study and studying becomes a habit, a hobby, a way of life? One feels that there is no advancement. Answer: The fact that studying turns into a lifestyle is very good. I began to study Kabbalah independently in 1976. In 1979 I found my teacher, and in 1982 I moved in with him. 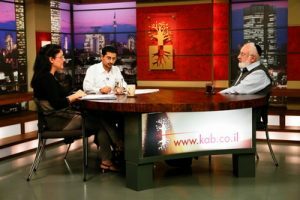 40 – 45 years of studying Kabbalah is quite a lifetime. I have no regrets. Looking at people of my age who are still alive, I see that I have not lost anything. On the contrary, I understand life no less than they do, if not more. I am glad I have students and I see the future in them. I cannot imagine that Kabbalah could disappoint anyone. Even if a person came to it for some time and then returned to his former life, nevertheless, he gained something, he added great upper Light to his soul. Although this Light is now in a frozen “stand by” state, nevertheless, spirituality does not disappear. It is an eternal state; only, now it is asleep. And then, at some point, it will awaken again in a person, and he will continue the spiritual path. Question: How can new students ask adequate questions? How does one ask correctly? Answer: Don’t try to be clever. Try to act from your heart. Ask the way you feel. Like a child who cries and his mother understands why and what he needs, so should you; if you ask what is in your heart, without overthinking it, everything will work out well. Then the Creator will give you an answer, and I will understand you as well. How Do I Get The Right Answers? The evil inclination means that I do not want to consider the environment, only myself, enjoying control over everything. However, when we discover that we are all connected in a single network, it turns out that via a negative relationship to others, we harm ourselves and threaten human existence. We need to complete ourselves by focusing on our own correction and building positive relationships. We need to think good thoughts about each other and increase the feeling of love in the world. Together, we are powerful.